One nice thing about going to Errington’s around the same time each year is reuniting with people who you have met on previous trips. We were fortunate to see Mr. Phillip Warden, Sr. and his son, Phillip, Jr. again this year. We first met the Wardens two years ago. 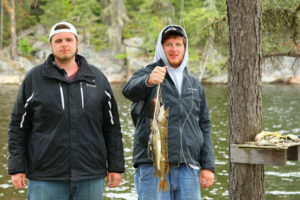 Both men are excellent fishermen and they always bring the largest fish to share for shore lunch. As you can see from the picture below, the Wardens helped to make sure that no one went away hungry that day. Last year the Wardens were joined by grandson Danny Warden and his friend, Austin Cronin. Once again, we enjoyed lunch with the Warden party at Camp Site Island. 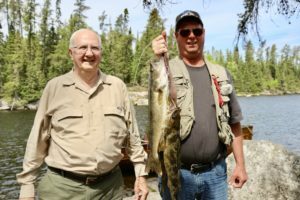 That day, the group had had a very successful morning of fishing and contributed a wonderful stringer of fish for shore lunch. And as always, no one went away hungry! We were fortunate to see the Wardens again this past June and enjoyed their company at a shore dinner and shore lunch. 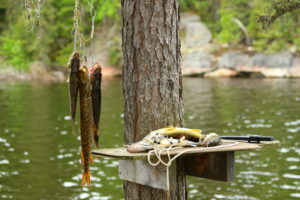 Shore lunch is always a special time to relax in a wilderness setting, eat a fabulous meal prepared by Chef Franky, share fishing tales, and get to know the other guests at the resort. Shore lunch is a memorable experience not to be missed.